Our group focuses on the physiology and pathology of sound coding at the hair cell ribbon synapse. 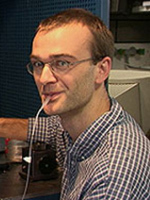 Molecular dissection and detailed physiological characterization of ribbon synapse function employ a spectrum of molecular and biophysical techniques such as single cell RT-PCR, immunohistochemistry of hair cells, auditory systems physiology (recordings of otoacoustic emissions, compound action potentials and auditory brainstem responses, single unit recordings), pre- or postsynaptic patch-clamp, optical methods (epifluorescence, evanescent wave and confocal imaging as well as flash photolysis of caged compounds). The group has contributed to understanding normal hair cell ribbon synapse function (reviews in Nouvian et al., 2006 and Moser et al., 2006). In our previous work we have physiologically and in part morphologically characterized mutant mice with defects in hair cell synaptic coding (Brandt et al., 2003; Khimich et al., 2005, Roux et al., 2006) and auditory nerve function (Lacas-Gervais et al., 2004). The results demonstrated that defects of hair cell synaptic sound coding cause sensorineural hearing loss in animal models  auditory synaptopathy and confirmed impaired hearing in case of nerve disorders - auditory neuropathy.